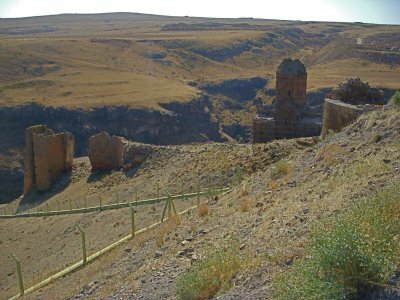 Ani is a site that is not as common as Palmyra in Syria, or Petra in Jordan, even so, the visit to Ani is a must if the traveler finds themselves in Kars. 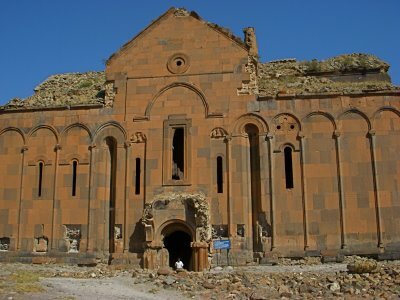 Residing 45 kilometers from Kars, the ruins of Ani sits on the border of Turkey and Armenia. A person on the street in Kars approached me and asked if I wanted to go to Ani, he said he arranges groups. There is no public transportation out to Ani. The person found four other people that provided a low cost for the excursion. 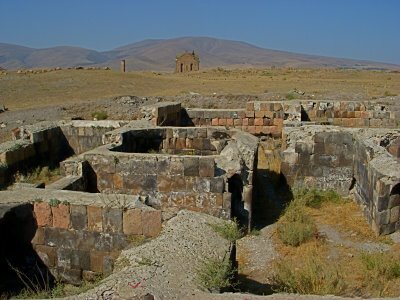 Ani was once the stately capital of Armenian and a major post of the east-west silk trade route. Ani is situated with three deep ravines creating a solid defense system, the northern plain demanded a double fortified battlement wall. 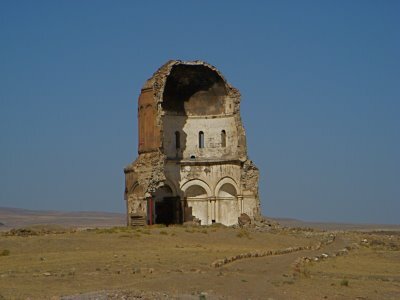 Ani dates back to 952 CE and experienced the kingdoms of Byzantines in 1045, to lose the area to the Seljuks in 1064. 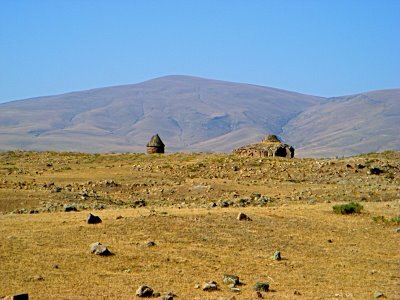 For a time Ani experienced the hands of the kingdom of Georgia the Kurds. 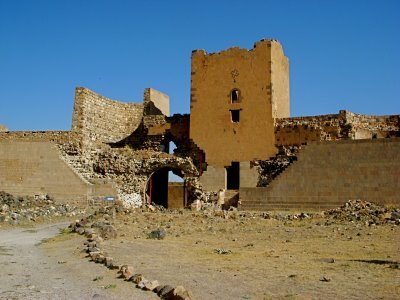 The Mongols arrived in 1239 and dispersed everyone, the Mongols found a non-interest in the city and an earthquake in 1319 added to the abandonment of the city of Ani. 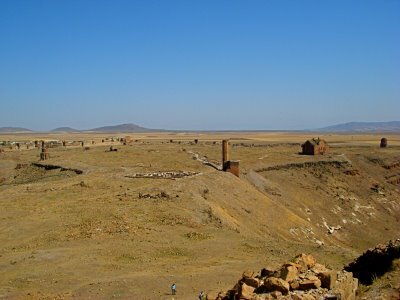 Once the trade route shifted, Ani became a dead city. Interesting enough, before the 10th century CE, The Urartians worship the Persian goddess Anahid here at Ani, the equivalent of Aphrodite of Greece that correlates with Mut of Egypt, Ishtar of Babylon, and the list continues. The same fertility goddess that Christendom worships during Easter. The name Ani is derived from Anahid. For some odd reason, a couple of the people from the group got in their mind that a person could be shot if you approach the border fence; the river gorge borders the two countries that you can observe from the pictures, the fence is on the Turkish side. The Armenia side is controlled by Russia with watchtowers and a military base. It is really amazing what people will believe nowadays, two of the guys avoided climbing the castle because of their fearful thoughts. I tried to explain that humanities fearful perception in life is utter hogwash. I walked the entire site, and near the fence, and I was shot 7 times. I found some holy water from the church, mixed the holy water with some holy mud and covered each gun shot wound, and presto, I was my normal self, just like any other day. The best part of this experience, I tried some of this holy mud on my face and now I look ten years younger. An adventurous thought crossed my mind, a person could travel for the purpose of trying (drinking) holy water that exists in the different churches around the world, an 8 ounce glass from each source would be enough. What a wonderful purpose, I guess the person could take on a label as “the holy water traveler”. 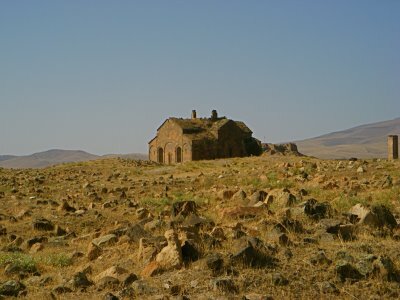 The churches that still stand are the Georgian and Armenian style type buildings. 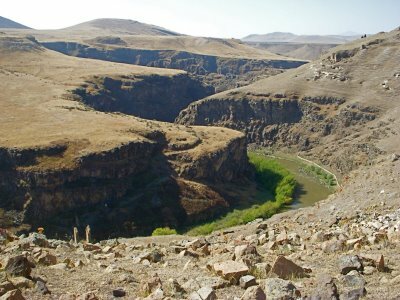 Ani is well worth the visit for any type of traveler, the river gorges are a beautiful site. I will have more pictures of Ani in the next post. Next post: No Reason to Judge.